Posted: October 31, 2013 | Author: thelondoncolumn | Filed under: Catastrophes, Funereal, Parks, Tall Tales | Tags: adventure playground, buried alive, cholera, Halloween, Rotherhithe, The Not Really Dead, The Undead | Comments Off on A thought for the Undead. 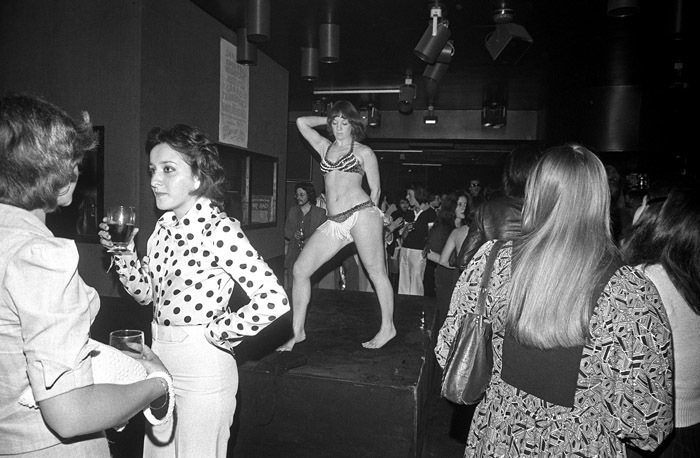 Go-go dancer, The Lord Wellington, Rotherhithe, London, June 1974. © Geoff Howard. 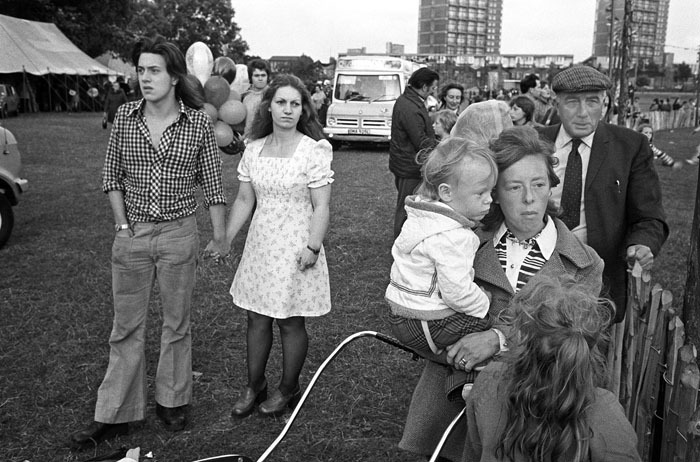 Carnival, Southwark Park, London, July 1974. © Geoff Howard. I photographed the people and places that caught my attention, shooting from an interest in, and a curiosity about, what was there and what was happening, happy to be working without the restrictions which often accompany commissioned projects. 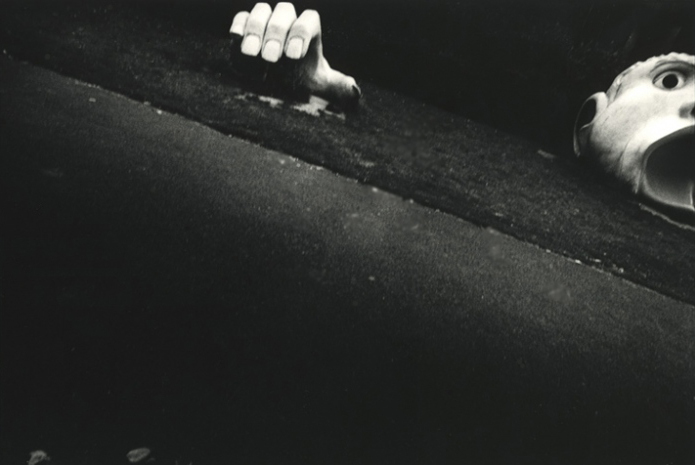 People have asked why I shot with flash – in those days, most photographers would only use available light – shades of Cartier-Bresson – but in the disco pubs, it was really dark – and I wanted to see, to show more clearly, what it was like, what was happening; less atmosphere, but more information. I stopped photographing there so intensively when I felt I had done the things which demanded to be photographed, and I didn’t want to make the same pictures over again. Then the whole area, the whole character of the area, changed – with redevelopment, new building, the yuppyfication of docklands; there were lots of photographers documenting the new docklands, and if I had continued, it would have been a different story, so it seemed like a natural end, a natural place to stop. I have been back, a few times – I was there last year, to try and check some locations when I started putting this book together; it was interesting, frustrating, indeed perplexing trying to identify places I used to know well, and now so changed. 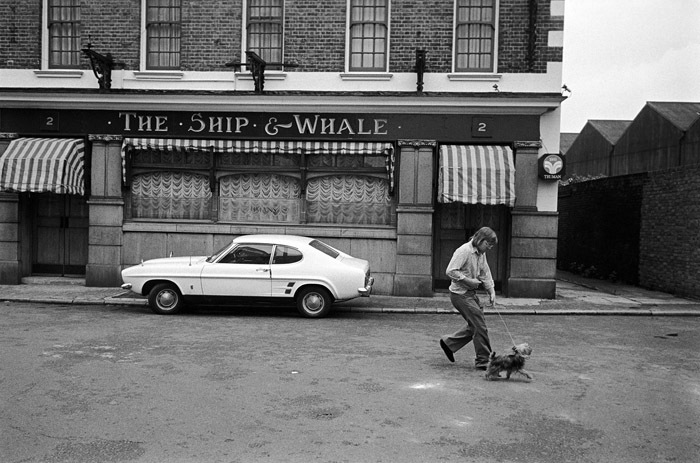 Ship and Whale, Rotherhithe. © Geoff Howard 1975. Mostly a terrible disappointment, with the dock buildings low and mean, and the horrible pre-war flats along Rotherhithe Street meaner still. But just once the conglomeration of utilities cracks into poetry, and it takes a bit of finding. In Gulliver Street, off Redriff Road, is a pub called the Ship and Whale. Beside it, a walled alley leads south. Walls give way to wooden slats with intermittent views of barges – if you run fast enough they coalesce like a movie strip. The slats in turn lead to a swing bridge, just a few feet higher than the rest, and the whole place suddenly unfolds. This is the main entrance to the dock, the Thames is only a few feet away, and the view all round the clock is water and ships, with the domes of Greenwich inflecting the horizon. Rotherhithe was a riverside village to the east of London in medieval times, but the real development of the area started with the major dock building in the first half of the 19th century; these docks were amalgamated into the Surrey Commercial Docks in 1864. Surrey Docks are only a part of Rotherhithe, but people tended to use the two names almost interchangeably. Surrey Docks underground station is at the south end of the docks; Rotherhithe Street itself follows the bend of the river Thames around the north side of the docks. Rotherhithe Street – the longest street on London – or was it in England – bordered by high walls hiding the docks, with just occasional gaps at a gate or bridge, with glimpses of water or warehouses, and like all the surrounding streets mostly deserted, a ghostly, uninhabited feeling, broken by small estates of council flats, a few pubs, some newsagents or little corner shops. The river on the other side of the road, often just a few steps down to the water. While these photographs date from 1971 to 1980, the majority were taken between 1973 and 1975. It was the time after the closure of the docks in 1969 but before the complete redevelopment of the whole London docklands area, north and south of the river Thames, during the 1980s. In 1978 Sally Williams of the Whitechapel Art Gallery put on a small exhibition of my work entitled Rotherhithe Photographs in the front gallery, and it is from those pictures that this book originated. The exhibition felt like a sort of completion to my project; I had done the things which had originally struck me and had made the area special. 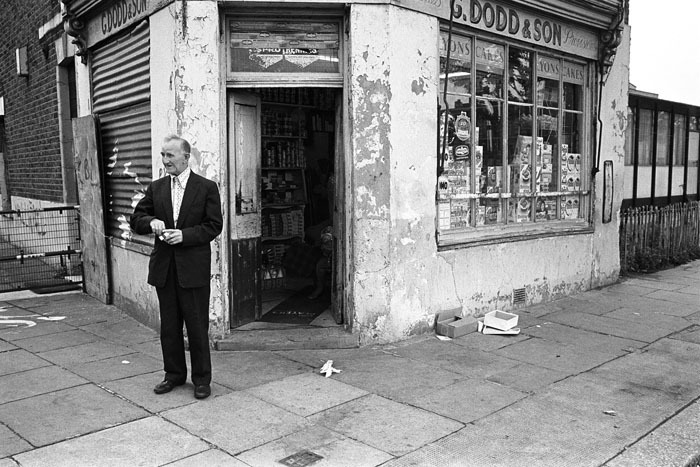 However, I continued to photograph from time to time, and in 1980 Tony Garrett of New Society magazine asked me to photograph the Downtown area for a story entitled Closedown in Docklands. When the London Docklands Development Corporation got round to the area south of the river, everything changed. What I had found there was gone, and I stopped photographing Rotherhithe. If I went there, I got lost; there were new roads everywhere. The mysterious passage which started beside The Ship and Whale pub and ran alongside the river, which had been for me the secret heart of the area, now no longer existed. And I still wonder, whatever happened to Dave and Carole? But the painted wall on which they marked their years together is gone too. The lives here were more than 30 years ago. So much has changed and vanished. Time really is the strangest thing. © Geoff Howard. 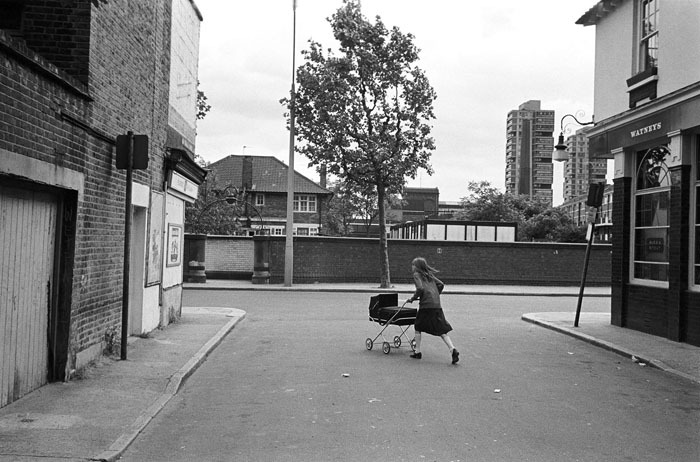 Rotherhithe Photographs: 1971-1980 by Geoff Howard is available direct from the photographer at £25.